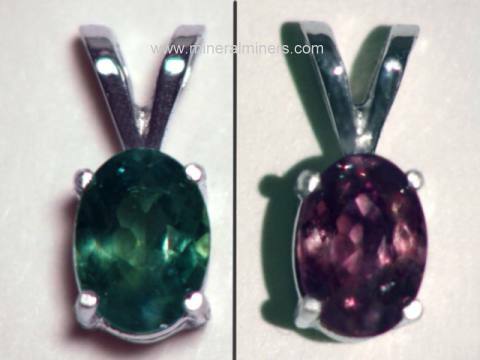 Try our natural alexandrite satisfaction guarantee - compare our prices and our quality. Alexandrite in Matrix Dimensions: 3.7" x 2.3" x 1.6"
This natural alexandrite in matrix specimen was mined in Bahia, Brazil. The gray schist matrix has alexandrite exposed in two areas on its surfaces. The alexandrite is translucent to semi-transparent with some naturally terminated surfaces. The alexandrite has dark green color under daylight, and it exhibits natural red-violet colors near some edges when viewed with strong incandescent light as shown. See also a full view photo of this natural alexandrite in matrix specimen. This specimen stands up as shown in the full view photo. Alexandrite Crystal with Matrix Dimensions: 0.55" x 0.4" x 0.1"
This naturally terminated alexandrite crystal has some mica schist matrix still attached. 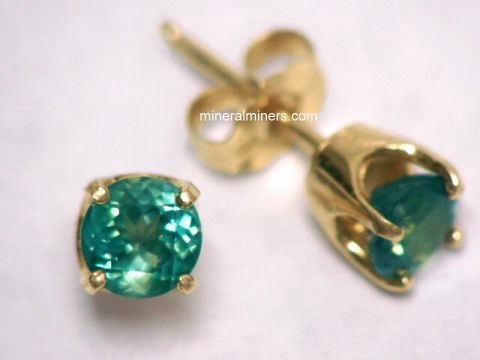 This small alexandrite crystal has dark forest green color under daylight. It is translucent to semi-transparent at its tip where it shows a very strong color change to rich red-violet hues in strong incandescent light. See a photo taken under incandescent light of this natural alexandrite crystal. See also an opposite side view of this natural alexandrite crystal. Alexandrite in Matrix Dimensions: 2.7" x 1.5" x 0.9"
This is a 100% natural alexandrite in mica schist matrix specimen that was mined in Bahia, Brazil. See a full view photo of this natural alexandrite in matrix specimen. 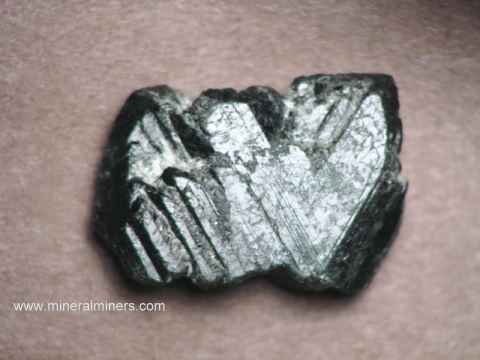 There are three partially terminated alexandrite crystals embedded in the schist matrix. 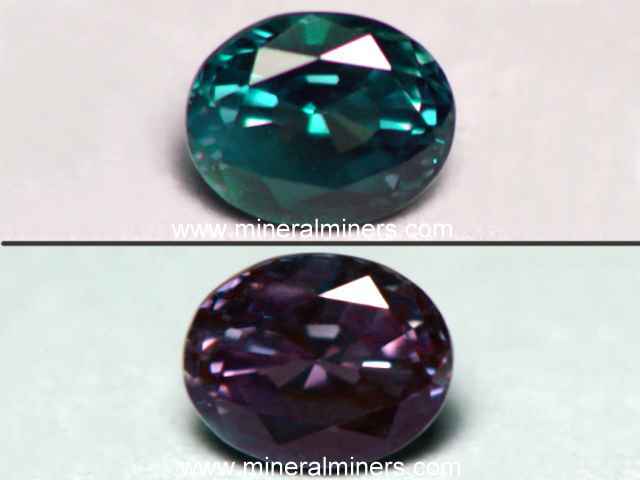 The alexandrite has dark forest green color under daylight. It is translucent to semi-transparent and has areas that show a strong color change to rich red-violet hues around the crystal edges under strong incandescent light. See a close-up photo under incandescent light of one of the alexandrites in this natural alexandrite in matrix specimen. See also an opposite side view of this natural alexandrite mineral specimen. Alexandrite Crystal Dimensions: 0.7" x 0.5" x 0.2"
This naturally terminated alexandrite crystal is twinned. The alexandrite has dark forest green color under daylight. It is translucent to semi-transparent and shows a very strong color change to rich red-violet hues around its edges in strong incandescent light. See a photo taken under incandescent light of this natural alexandrite crystal. See also an opposite side view of this natural alexandrite mineral specimen. Alexandrite in Matrix Dimensions: 3.7" x 1.8" x 0.8"
This is a 100% natural alexandrite in mica schist matrix specimen that was mined in Bahia, Brazil. 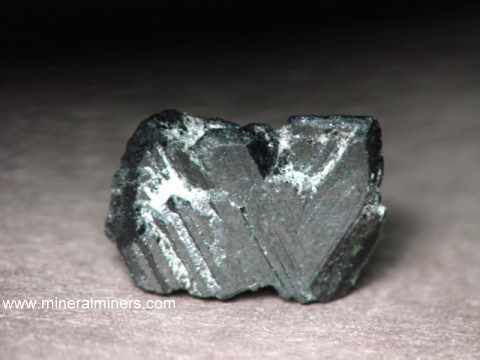 There are several naturally terminated alexandrite crystals embedded in the schist matrix. The alexandrite has dark forest green color under daylight. It is translucent and has areas that show a strong color change to rich red-violet hues around the crystal edges under strong incandescent light. See a photo showing an incandescent light held to one of the alexandrites in this natural alexandrite in matrix specimen. 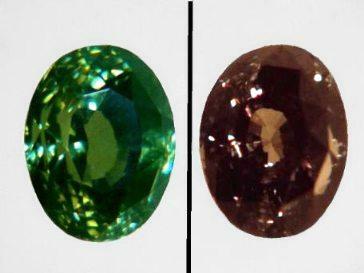 This 2.42 carat natural alexandrite cat's eye cabochon gemstone has a fine color change from rich dark bluish green in daylight (see left side of photo at left) to a dark grayish purple color under incandescent light as shown in the right side of the photo at left (alexandrite is a rare chrysoberyl variety with color change under different kinds of light). 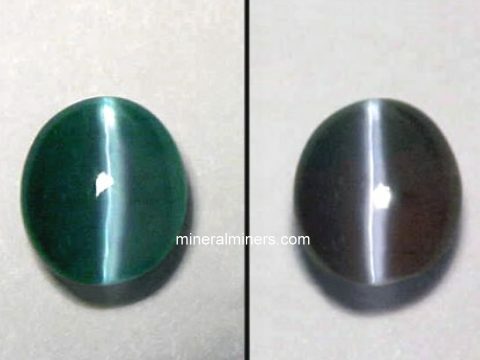 This natural alexandrite cabochon gem has completely natural color - it is unheated and untreated. It is very clean and it has a very sharp and well developed blue-white cat's eye as shown at left. See also an end-view under incandescent light of this cats eye alexandrite gemstone. See also a side-view under daylight of this cats eye alexandrite gemstone. This natural alexandrite cat's eye cabochon gem was ground and polished from a natural chatoyant alexandrite crystal that was mined in India. The GIA Certificate will be included with this natural catseye alexandrite gemstone. 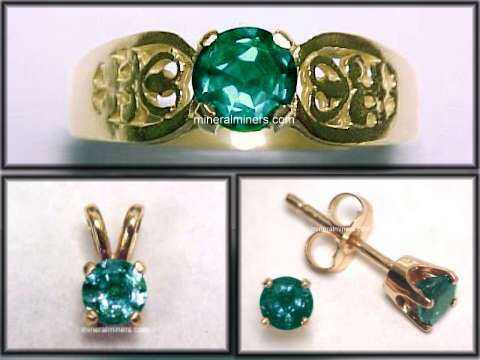 This is the end of our Alexandrite Rare Quality Items page. 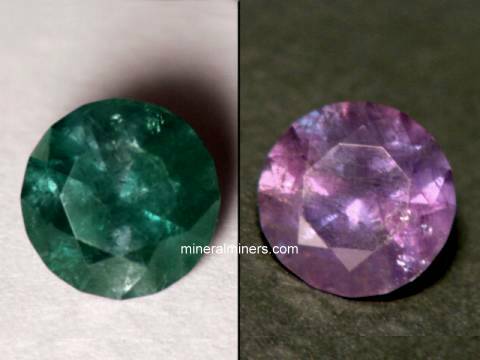 See also our pages displaying alexandrite gems (natural alexandrite gemstones), and our natural alexandrite mineral specimens. 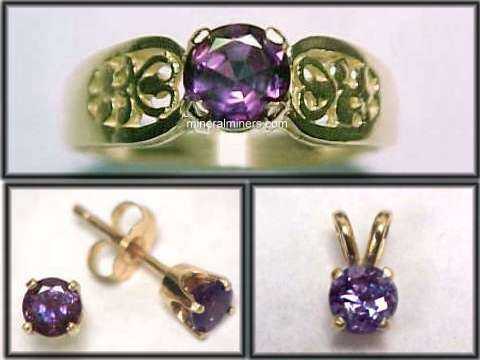 See also our page displaying Natural Alexandrite Gemstones. See also our page displaying Natural Chrysoberyl Cats Eye Jewelry. 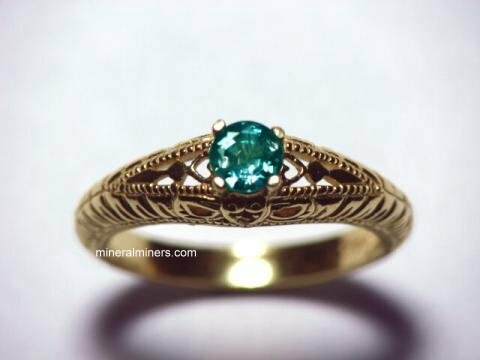 Would you like us to inform you when we add on this page more natural alexandrite gem, mineral and jewelry items? We have a large inventory of natural alexandrite items in stock at our mineral warehouses, so be sure to let us know if you have any natural alexandrite special requests. Please contact our webmaster or our 'site' geologist with any questions or comments.